Debut episode, in which we meet our heroine, Mary Hartman, and her assorted friends and family members. While Mary worries whether her kitchen floor has developed a waxy yellow buildup, her best friend and next-door neighbor Loretta arrives with some shocking news. But that's not the only shocking news Mary will receive before the episode is over. . .
And so begins our long, long journey through 325 episodes of the truly one of a kind, utterly brilliant, incisive, dryly satirical "Mary Hartman, Mary Hartman". . . This episode accomplishes everything a first episode needs to do, establishing the tone of the series and introducing us to the main characters. But it's also very funny, and contains two shocking plot developments that would have been unthinkable in any other contemporary series. What kind of a maniac would kill 2 goats and 8 chickens? And the people. The people, of course. If you get the humor in that line, chances are you'll get the show. While Loretta is waxing philosophically about the meaning of such a horrific event, Mary wonders aloud about having a cup of coffee, and why the Lombardis were raising goats and chickens in the middle of suburban Fernwood. It's hard to imagine any actress but Louise Lasser playing these beats just moments into a brand new series without losing audience sympathy, but somehow, she pulls it off. There's something so real, so authentic about Mary, even though all we've been shown so far is how shallow she is. She's a person who uses the safe, mundane, surface aspects of life, like consumer products and waxy yellow buildup, as a buffer against reality; it's not callousness or self absorption, but self-protection. This is Mary's coping mechanism, maybe her only coping mechanism. She retreats to these trivial, absurdly conventional concerns because the world beyond her waxy, yellowed floors has become too scary and incomprehensible to face. The second shocking plot development comes at the very end of the episode, when Mary receives a phone call from the police informing her that Grampa Larkin is in jail, arrested as the Fernwood Flasher. This was the scene that sold me completely on the series the first time I saw it in 2007. Louise Lasser's hysterical (in both senses of the word) reaction cracked me up then, and it still does every time I watch it. It's a perfect encapsulation of what made her Mary so amazing: She's slightly uncomprehending, slightly dazed, funny yet still somehow legitimately, even tragically, vulnerable. Controlled hysteria has never been funnier. Lasser has admitted that she herself didn't entirely "get" the tone of the series at first, but to me, she appears to have found her character completely from her very first moment on screen, seen dreamily watching an afternoon soap opera on her kitchen TV. It's impossible to imagine the series having worked with any other actress as its anchor1. Louise Lasser's performance was a revelation to me, not just in its consistent brilliance over the course of 325 episodes, but in her bursts of staggering inspiration in certain specific scenes and episodes. I've always enjoyed her in any role I've seen her play over the years; I already knew how funny she could be, but I had no idea what a truly great dramatic actress she is as well until seeing MH2 in full. We also get our first glimpse of the private life of Charlie and Loretta Haggers next door (Graham Jarvis and Mary Kay Place), one of the few convincingly romantic relationships on television between two people this hideously mismatched in age and physical beauty. Credit where due: you've gotta hand it to Mary Kay Place for her acting talent. It can't have been too challenging for Graham Jarvis to convince us he's a lovestruck husband opposite a woman as naturally gorgeous as Place was, but the other way around? If you don't think this required major acting chops, your eyes must have shut reflexively when Charlie emerged from the bathroom shirtless, because. . . my goodness. Also included in this debut show is the first of many, many brilliant scenes between Mary and Tom alone in their bedroom, with Tom coming off immediately as a complete tool. His character displays more depth as the series continues, but in the earliest days of the show, he sets my teeth on edge in his unbelievably sexist, demeaning, dismissive treatment of his wife. The marital troubles they experience provide one the show's best means of exploring the changing war between the sexes during this time period. One of the reasons the show feels so modern despite its 1970s trappings is that too many of the battles over gender roles portrayed in MH2 are still being waged today. Those totally new to the show may not know what to make of it at first. This is perhaps the first comedy to completely eschew a laugh track in TV history2, another element that makes it feel very modern in our current era of mostly single camera comedies. The acting is very naturalistic, with sloppy grammar and stuttering and repetitive rambling akin to the dialogue in a Woody Allen film3, or an episode of Curb Your Enthusiasm. This, too, is an unprecedented quality for a television show of its time, when actors in comedies and dramas alike invariably delivered flawless readings of every line. There's so much more to discuss in just this first episode, but there's plenty of time to delve into the many other aspects of the series so well worth examination. I hope to have some other regular contributors or at least guests along the way, assuming I can sell some of my friends on watching the show; it's so utterly different from anything else I've seen that it's hard to predict who will get it and who won't. But even if I end up going it all alone, I hope you'll join me and please offer your thoughts in the comments section. I never thought I'd have the opportunity to see the whole series, and I'm delighted to say a show I waited a generation to see not only didn't disappoint, it far exceeded my expectations, and I already knew I loved the measly 25 episodes released by Sony in 2007. Per the blog's tagline, it's time to scrape the waxy yellow buildup off the reputation of this unjustly neglected classic. Many thanks are due to Shout! Factory from all of us who have waited so long to see it. Thanks for writing this great review. I hope you can make it through all 325 episodes! I will be watching and following along with you. I only have the first 25 episodes currently but hopefully the price of the box set will drop soon enough. Thanks for writing a great comment! I really appreciate the kind words-- I'm new to all this and so far feel a bit like I'm screaming into a void. Glad to have you on board! I've seen listings for the set as low as ~$130, but that's still pretty pricey. Believe me, I couldn't afford this set either, but I just didn't care! I've been waiting to see it ever since I first read about it 25-30 years ago, yet it never really came back in reruns. I presume the 25 episodes you have are the Sony DVDs from 2007? In case you weren't aware, that set contained a lot of episodes that were further edited for reruns (the ones under 22:30), which has been corrected in the Shout! Factory set. Actually I watched the first 25 on Youtube. Someone uploaded them, I assume from the first DVD set. If I end up buying the new set I'll definitely rewatch them to see the unedited versions. Thanks for the heads-up! Yes, those are ripped from the Sony DVDs. I don't know how people get away with that kind of thing. There's NO WAY that's legal activity. I'm glad the first few shows are accessible, but I really hope no one undercuts Shout! Factory by uploading the rest. They're a great company product-wise, but they don't have a clue about marketing or protecting their properties. Stuff from various Shout! DVD sets is all over youtube and they could very easily prevent this if they wanted to. Me, on the other hand? I posted a clip a few months ago of Groucho Marx guesting on the Jackie Gleason show, a video that hasn't been rerun since it aired 50 years ago nor ever been made available on home video-- and I immediately got a copyright strike from Jackie Gleason Enterprises that is crippling my youtube account. And this was only a clip, not the full show, not ripped from a commercial DVD like the MH2 episodes were. Even worse, the clip was in B&W (the original film was in color), and in terrible video quality since it came from a private collector. How this poses a threat to Gleason Enterprises, I'll never understand. Meanwhile, folks rip commercial DVDs and post them and get away with it for years. It's inexplicable. I love youtube because virtually anything you want to see is there, but the manner in which they deal with individual channels is often inexplicable. I also don't understand some production companies. If a channel is uploading full episodes of content already released on dvd, I can see how that would harm sales, and by all means, it should be removed. However, small clips and many fan-produced tributes can generate more interest in a product and actually boost sales. Unfortunately it seems that legal departments of production companies penalize every account the same way instead of treating them on a case-by-case basis. Your clip obviously posed no threat to Jackie Gleason Enterprises and would've helped promote future sales. This is a most excellent review and commentary. It is so insightful and well-written. The structure and content flow so effortlessly. I seldom read reviews with such clarity and intelligence on a fan-based website. Well done and thank you for the effort you obviously gave this fine work. Someone has to do it. . . Thank you so much, SkipEastport-- that's the most encouraging comment I think anyone could possibly have made. I really appreciate it. I haven't been writing on any kind of a regular basis for a lot of years, so I'm more than a bit apprehensive. You made my day. I just want to do justice to the show-- and I truly believe no ordinary single-article review can begin to cover all this show has to offer. Actually, there aren't many traditional reviews of the DVD set popping up yet. I think the problem may be that no one, but no one, has seen the series recently enough to be able to write a well founded review without actually watching at least most of the episodes first, and that's a 100+ hour prospect. Working critics don't have anywhere near that kind of time. The comments regarding Tom made me chuckle. I watched MH2 in its original syndicated run, and even in those politically incorrect times, I questioned his behavior. I loved the character of Mary so much that I automatically loathed anyone who caused her pain. Watching the series as a 40 something man, I've got a new appreciation of Tom, not because of his chauvinistic attitudes, but because the character is so much more complex than I recognized in the 70s. As an 11 year old kid watching in 1976, I didn't pay as much attention to the nuances of relationships. Tom obviously loves Mary and his family, but like so many men of that era, he doesn't know how to express his love. As the series progresses, my heart goes out to Tom as he keeps getting in his own way. He's as much a victim of traditional gender attitudes as the women are. There's a great scene in episode 95 when Tom defends his love for Mary to one character, and yet in a subsequent scene, he can't respond when Mary begs him to let her love him. I become so annoyed when people dismiss MH2 as just a funny little soap opera, because it's much, much more. The scenes between Mary and Tom are so raw, so personal they're truly painful to watch. Despite Tom's occasional behavior as a total prick, Greg Mullavey's performances are always spot on. I remember reading interviews with other cast members who lamented how overshadowed Mullavey was by Louise Lasser, because his own performances were equally brilliant. Both actors deserved an Emmy for their work. Well said, SkipEastport. Tom isn't a bad person, but he's basically an emotional cripple who has no idea what he wants out of his life or his marriage, and (usually) has no idea how to communicate his feelings to Mary. I can relate to your protective feeling toward Mary-- part of what made it hard for me to warm up to Tom is that he's easily at his worst in his treatment of Mary. He's generally shown to be a pretty good guy with everyone else. But he's got this unbelievably sweet, doting, terribly fragile mate who wants nothing more out of life than to feel loved by him, and he's just awful to her! But if you're looking for an honest portrayal of middle aged frustration, you'd be hard pressed to find a better, truer performance than Mullavey's. I didn't even know about the Emmys-- It's shocking that neither of them won. I'll have to look up who was nominated/won that year, but I'm guessing the fact the show wasn't on network TV seriously hurt it in the voting, kind of how the early HBO masterpieces like The Wire and The Sopranos got shafted in the early 2000s. SkipEastport and WGaryW, I absolutely agree with your observations on Tom Hartman and Greg Mullavey's ferociously underrated performance. As I watch episodes 94 to 98 in the first season, I'm noting how smartly--and sharply--the writers build Tom as a husband incapable of giving his wife the emotional connection and security she needs. For these episodes, Tom needs to be distant and unable to provide love to Mary so she can make the believable choice to finally fill this need with Sergeant Foley. At the same time, Tom can't be an unfeeling monster or else Mary (and the audience) would feel no conflict in the decision. It's an incredible challenge for an actor: stay human and relatable while displaying unlikeable emotional flaws that are entangled in frustration, masculinity, and love. As Greg Mullavey plays him, Tom is a sad figure, but never a cardboard despot or misogynistic stereotype. There's real heartache for both partners in those bedroom scenes. Mullavey is also one of MHMH's actors whose performance rhythms never feel inauthentic or scripted. This series is blessed with unique actors who commit to their craft, but Mullavey especially always delivers lines that feel natural and organic to him. (I think Graham Jarvis has a similar style, and I always enjoy the chemistry in the Tom-and-Charlie breakroom scenes.) It took me a few episodes and some time with the character to see the brilliance of Tom repeating his words in every emotional moment, as in "I'm damn mad, Mary, damn mad!" But the repetition speaks to the fundamental problem in Tom's character: he communicates often, but he fails to truly communicate because his words become a wall, a posture rather than a true and honest connection. Such a difficult challenge to bring a character like Tom Hartman to life, and such a fearless and effective performance that Greg Mullavey gives in doing so! I watched this show when it first aired back in '76-'77 - as much as I could. It ran very late at night and I was only in junior high! So, I'm watching many of the episodes for the very first time now. It's an absolutely remarkable show on all the levels you mention in your review. Thank you for being interested. :) I hope you'll be posting more comments as I go along! I really appreciate it. It took me several viewings to catch this detail, but now it's one of my favorites - when Harold Clemens knocks and frightens Mary and co., Loretta grabs some chips to munch on en route to the door. Absurd (and ad-libbed?) little moments like this one are part of what makes this show so special to me. I hadn't noticed this specific detail until you pointed it out, but in the more general sense, I'm with you 100%. Some of the funniest stuff is in completely thrown-away, backgrounded gags. It took me until till halfway through the series before I picked up on Heather's sugar adiction. I can only imagine how much I've missed, having only watched the series once in a giant binge over a single month! Great to have you on board, RedOwl. Hope to see much more of you in future comments. 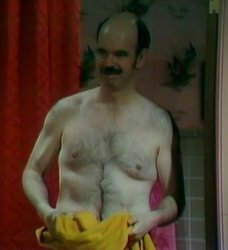 I've always interpreted that moment of a flabby, hirsute Charlie Haggers entering the bedroom without a shirt as a sublime send-up of the soap opera staple (that uses a toned and virile young buck instead). Pretty fearless for both the actors to perform and for Norman Lear to include in the pilot that he is using to sell undecided TV stationmasters on his sui generis show!